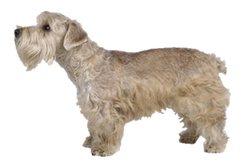 The history of the Sporting Lucas Terrier begins after WWI, when Sir Jocelyn Lucas began breeding Sealyham Terriers. He kept a pack that was well known for their working abilities, but as the Sealyham began to get noticed in the show ring he grew concerned over the new modifications and changes that made it, in his opinion, impossible for the dogs to continue working. After WWII he began developing his own strain, crossing his Sealyhams with small Norfolk Terriers, which overtime created a smaller, more capable breed. Is the Sporting Lucas Terrier Right for You?